Lawbreakers is a fantastic game. It has brought back the arena shooter genre in a way that it needed to come back for a long time. Before Call of Duty, before Battlefield, before Halo, before any modern FPS of any kind there was only one type of game, arena shooters. Games like Quake and Unreal Tournament were the at the forefront of modern technology. With their fast paced gameplay, high skill ceilings, and ease of access, arena shooters paved the way for all modern shooters that we see today. But after the early 2000s, games evolved. Realistic and tactile shooters became the norm with games like Medal of Honor, Call of Duty, and Battlefield making their way to the top of the charts while the arena shooter was left in the dust. But many of us never forgot the arena shooter and over the past few years, they have become to make a comeback. Games like Toxikk, Doom 2016, and the Unreal Tournament remake have moved into the sights of gamers. But while these games are well made and fun, they lacked some of the substance that modern games have. There needed to be a middle ground between the arena shooters of old and the battlefield shooters of today. 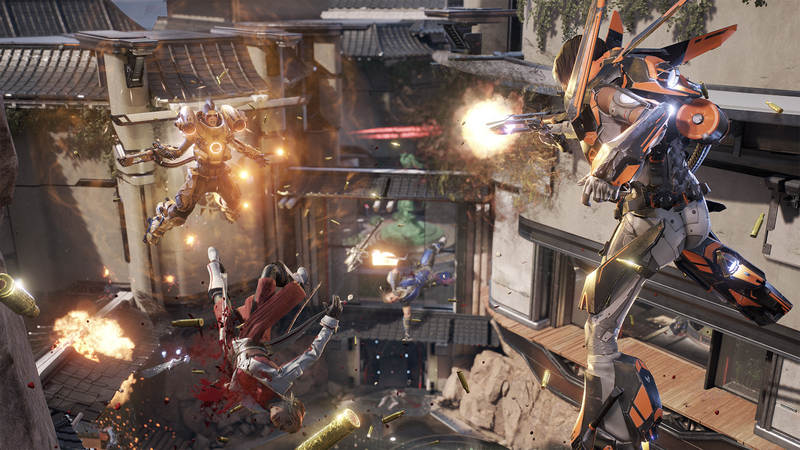 Lawbreakers is shaping up to be that game. Before we begin let me say that Lawbreakers is in no way trying to be Call of Duty or any like shooter. It is, at its heart, an arena shooter with modern mechanics. 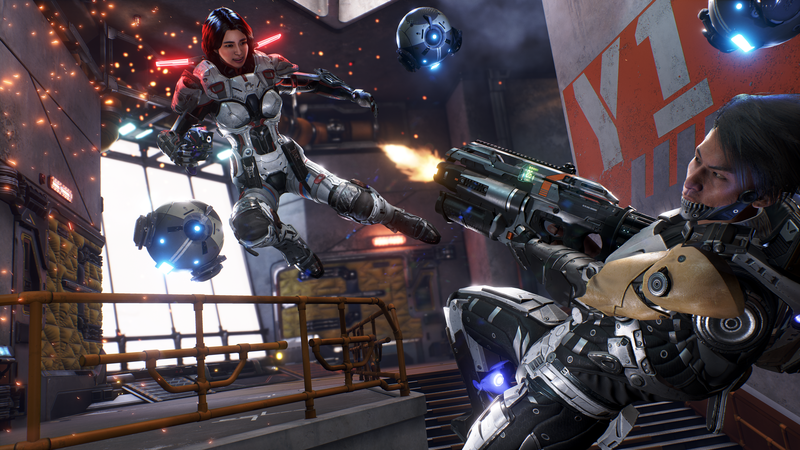 But those modern mechanics don’t come from modern shooters, instead, Lawbreakers (LB) did a lateral move and borrowed some aspects from MOBAs and hero shooters. The basic mechanics of LB are the same as any other arena shooter you’ve come to know and love. Move fast, pick up armor and health via respawning pickups around the map and complete the objectives laid out for you. However, LB takes it one step further by giving you a wide range of characters to choose from. Unlike other hero shooters and MOBAs, where the gameplay is non-canonical to the lore of the game (as you usually have the same characters fighting each other) LB actually made two distinct factions. The Law are a group of highly skilled, highly trained peace officers attempting to stop the Breakers, a radical group of criminals who recently escaped prison following the gravity event (more on that later.) Both teams have the same classes, each with similar looks, same hitboxes, and abilities, but it still provides a cool aspect to a game like this we haven’t really seen before. Each faction’s characters even have their own set of skins, adding to the interest in Stache Drops. Each of the current nine classes offers unique and polarizing options to how you choose to play the game. Each character class has a powerful primary weapon, either a secondary weapon or an alternate fire and three different abilities. These generally consist of one movement based ability, one grenade-type ability and one powerful ability on a long cooldown that works as an ultimate. However, this isn’t always the case. The Juggernaut class for example, has no ultimate ability. Instead, he just has a third ability on a shorter cooldown and the Battle Medic has no grenade ability due to her healing drones, but she does have a alternate fire as well as a secondary weapon. Each character also has a different amount of health dependent on their style of class. Faster characters like the Assassin have low amounts of health while slower more heavy hitting characters like the Titan have higher amounts of health. The diversity of characters allows a player to choose their playstyle. Unlike a hero shooter like Overwatch, class choice is not super important and any cast of characters can win any game, however it may behoove you and your team to try and strategize offensive versus defensive characters and who will play what roles. For example, a high healthed, short ranges Juggernaut should probably defend the objective while the fast flying Vanguard might be the one to capture the flag. There a few other gamemodes but my personal favorite is Blitzball. Aside from its fast paced gameplay, the ball is also voiced by none other than Justin Roiland. The ball will constantly yell at the players that it has been dropped, is about to score and a host of other quips. As a huge Rick and Morty fan, this just makes the game that much better. In addition to all these gamemodes and the maps designed to accompany them, there is one key gameplay element that LB has over most other arena shooters: low gravity. The lore of the game says that there was an event that caused pockets of gravity loss throughout the world. Each map takes place in one such location. In the center of the map, where the neutral objective spawns, there is a bubble of low gravity. This allows every class to float and move about with more ease. Since most engagements take place around the center, this puts all classes on an even playing field. Flying classes no longer have the advantage as all players can float and move around this area. This unique gameplay feature gives LB that extra push towards greatness as it requires a new level of skill and strategy to navigate this area and effectively obtain the objective. 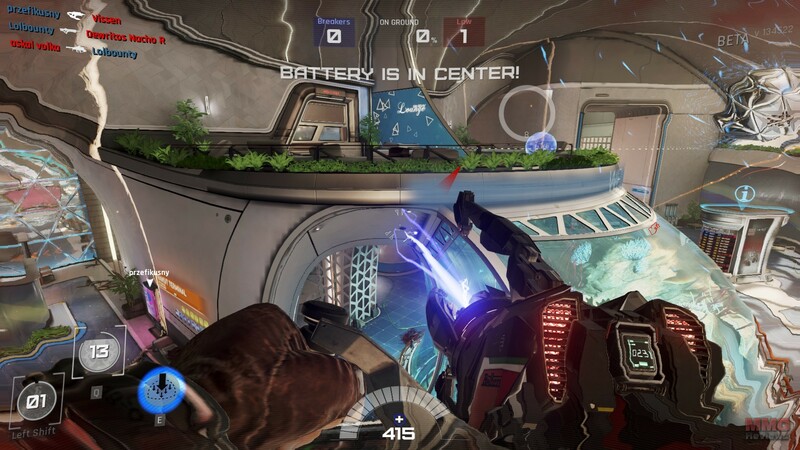 There is only one area that I worry about with Lawbreakers and that is game longevity. The game has already launched to an uneasy player base. This isn’t the game’s fault, but we live in a world where triple A games like Overwatch dominate the market and any game that is even remotely close is considered a copy or clone. While LB is nowhere near an Overwatch clone, it did hurt launch sales and potentially will hurt continuing player bases. It will be up to Boss Key to continue to update and tweak the game as well as add content over time. Hopefully the Stache Drop system will help them do that. Stache Drops are LB version of loot boxes. You earn one when leveling up and each one contains four cosmetic items. Stache Drops can also be purchased for money. I hope that Boss Key continues to maintain this game and add more content. I was initially worried they might not, but a few days after the game launched, there was a small update to tweak some bugs in the game and now I have faith that they will. Lawbreakers is a fantastic game. It has brought back the arena shooter genre in a way that it needed to come back for a long time. It’s inexpensive price tag means you don’t have to shell out all of your hard-earned cash just to play. This is a game I always have fun with and will probably continue to have fun with for years to come. Listen to me and many other reviewers and do yourself a favor a pick up this game.